The show is set to chronicle how Norman’s psyche evolved while growing up – leading up to the infamous events that eventually transpired at the Bates Motel. The show will air next year. Vera Farmiga as Norman's mother is a fantastic choice! I approve of this 100%. It's weird, but I was just reading about Anthony Perkins and Psycho just a few days ago and didn't hear anything about this show. cool teaser. I wonder if this will do well. A&E is not exactly my go to channel... now or ever. Neither was AMC. All a Network or Channel needs is 1 quality show that gets them over the hump. AMC did it with The Walking Dead, FX did it with Sons Of Anarchy and Justified and Syfy did it with Battlestar Galatica. Not to be outdone, FOX did it with Married....with Children. Yes, I consider MWC to be high quality!! Well, funny quality at least. I LOVED MWC when it was on... and love the later seasons more than the earlier ones. And since I'm a jerk about semantics, SciFi had a hit with Galactica. Syfy has... what, exactly? Cause when you make a name change like that, you jettison your previous achievements. As for Bates Motel, I don't see it lasting beyond 13 episodes. Anything like this I find highly unlikely to make it through a second season. But it'll make them quick fast hard cash for a little while, and that's important, right? How can you not be pumped for this after watching that? I read yesterday, Bates Motel has no intentions of being faithful to Hitchc ocks movie. They are going to take liberties and tangents. That was a given just based on the few short snippets of stuff we've seen and it's going to be contemporary and not set in the 60's as the movie was. I mean, it looks like it's gonna be contemporary because none of the stuff currently floating around out there looks 60-ish. What's up with all of these 15 seconds-only promo's? Give me a frickin' 2 minute Trailer already! Ack!! So we are into the 2nd episode of Bates Motel and it just slowly reeled us in and hooked us. I was a little discombobulated for a little while. As we said, it’s not following Psycho, but more of a mashup of the old story and setting to present day and Mom (Norma) and Norman's perspective. It is Psycho's house and hotel setting. Come to think of it, this mashup is refreshing. I know they are going after the younger crowd with the current setting, because they already have a captured audience with the old generation. I don’t know what limits A&E set, but like AMC, it appears they are going to push as much as possible. The first episode had a pretty brutal ****. I like what I’ve seen and will make efforts to stay with it. Casting Freddie Highmore as Norman is spot on and I swear they brought on Nestor Carbonell (Sheriff Alex Romero) because of looking so much like a young Anthony Perkins. Well, maybe he could act too. It took a week for the first episode to get into the queue on Hulu. I will watch it sometime this weekend. I originally planned on watching Psycho to segue into Bates Motel, but for whatever reason, my DVD wouldn't play on any of my DVD players or even on my Xbox. Anyway, I just got finished watching the Pilot episode and I am more than happy with the setup for both the series as well as the characters. My biggest concern was how they would make the relationship of Norman and Norma. 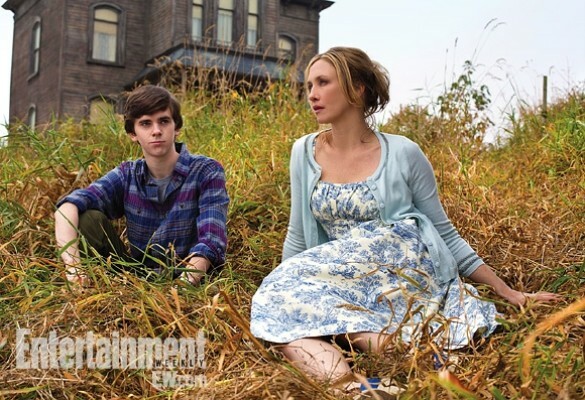 To say that both Vera Farmiga and Freddie Highmore are perfectly cast in their respective roles is an understatement. I love the chemistry they both share. They play off each other with ease and makes everything in the movie a bit deeper (even if I didn't get to watch it today). Adding Nestor Carbonell to the series as the Sheriff is also good too. But the coolest thing about the set up is that it's implied that the Hotel itself was already home to shady things going on long before the Bates moved into it, based strictly on the black book that Norman finds while tearing out the carpet. And from the angle of a couple of images on the pages of the book, the 'peep hole' was already present. Good twist at the end. Obviously someone is being drugged and tortured. But who is the captor and where? Maybe the Sheriff? I only say that because I suspect that he saw the body in the bathroom and chose not to reveal that he saw it....keeping the secret for everyone's sake. Just an idea.